Bacteria Battery #5 is an installation of Biotricity series where the fluctuations of electrical energy generated by microbial fuel cells are sonified in eight channel sound environment. 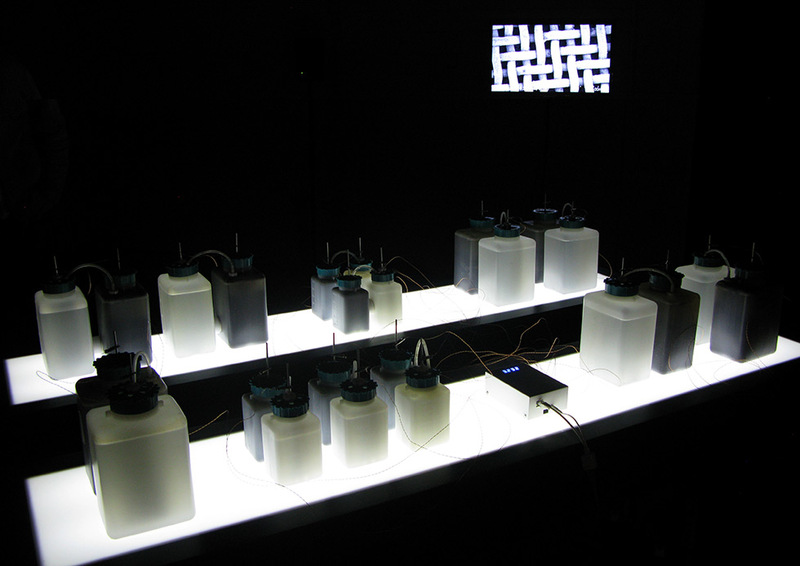 The installation consists of 12 – 16 microbial fuel cells where the electricity is generated by bacteria living in a mud, eight speakers and video of microscopical images of the bacteria manipulated by the live sound. Biotricity sonifies the process of generating electricity from bacteria living in pond and lake, or in common, everyday waste water. The microbial fuel cells is the next-generation bio-technology that converts chemical energy to electrical energy by using microorganisms – bacteria found in the dirty water. Someday, this technology could be used to upgrade waste treatment facilities into power plants producing renewable energy. The networked sound & bio-electrical installation consists of a microbial fuel cell network altogether creating a mini bacteria-power station. Continuous measurements deliver audible and visible impressions of this form of electricity generation by microorganisms. Thus the “bacteria fuel” process is interpreted in sound structures providing an aesthetic perspective on the interaction between nature and technology, biologic systems and electronic networks, biology and computing. Credits: RIXC – production; Rasa Smite and Raitis Smits – artistic concept, visualisation, graphics; Voldemars Johansons – sonification; Martins Ratniks– video; Arturs Gruduls – scientifc solutions and monitoring; Solid State Physics Institute of Latvian University – partner, scientific solutions.